The WHO says East Asia is more prepared for Ebola than any other region. Still, it must keep its guard up. The the Ebola epidemic in West Africa showing no signs of being effectively contained, and the latest news of health care workers infected with the Ebola virus in the United States, prospects of the deadly disease hitting Asia can no longer be excluded. Anthony Banbury, Head of the United Nations’ emergency Ebola mission has warned that the Ebola virus is “far ahead of us and every day the situation gets worse”. Against this scenario, how can Asia prepare itself? In 2013, East Asian states working through the ASEAN Plus Three (APT) framework (including China, Japan and South Korea) pledged to use cooperative mechanisms to improve disease surveillance and to boost pandemic preparedness and response in the region. Lessons from the SARs outbreak in 2003 had prompted countries in East Asia to establish this regional framework for combating highly infectious pandemic outbreaks. While the response is more than timely under the threat of Ebola, further commitments and actions, through increased financing, vigilance in disease surveillance and using mobile health infrastructure are critical steps to prevent an Ebola outbreak in the region. Moreover, East Asia’s contribution to boost the supply of qualified health workers in West Africa can go a long way in checking the spread of the Ebola epidemic beyond West Africa. The deadly Ebola virus has already killed about 4,000 people in West Africa since its outbreak earlier this year. With the alarming rate of infection, the UN has called for a twenty-fold increase in the global epidemic response. Despite complaints of a belated global response—the WHO declared Ebola to be a Public Health Emergency of International Concern (PHEIC) only in August — several countries have now come forward to provide the much needed financial assistance to affected countries in Africa. The U.S. has topped the list of contributing countries, pledging about $68 million. Washington was followed by the United Kingdom and Germany at $19 million and $15.3 million respectively. Most recently, the IMF fast-tracked $130 million in aid to fight the Ebola epidemic while the World Bank contributed $105 million. While financial assistance is no less critical, West African leaders and humanitarian workers on the ground have also urgently called for more qualified and trained health workers to be deployed in the affected areas to stem further infections. So far, East Asian countries have responded to the call for help. The Philippines recently announced plans to deploy a substantial number of its health workers in West Africa, while Malaysia has pledged to send more than 20 million medical gloves to affected countries. Japan has already given about $2 million to the WHO, UNICEF and the International Federation of Red Cross and Red Crescent Societies since April, and further pledged to provide personal protective equipment (PPE) and laboratory experts. Prime Minister Shinzo Abe has suggested Japan may provide up to $40 million in aid. Meanwhile, China has sent two medical teams, mobile laboratories, around 170 health workers and more than $5 million in humanitarian aid. This week Beijing pledged $16 million more in aid. With a fast spreading Ebola, more can be done to combat the disease. The Ebola virus has evolved since its first outbreak in Central Africa in the 1970s. While transmission used to be limited to forested, remote and rural areas in West Africa, the latest outbreaks are now seen in urban areas. The reported rapid rate of infection has been caused by the weak and often substandard health systems in these countries. Since Ebola has similar symptoms to malaria, typhoid fever and meningitis, effective diagnosis has proven to be a tough challenge. The Ebola outbreak has also seen an alarming feature of health workers at high risk of infection. So far, the WHO has reported 233 deaths of health workers while caring for Ebola infected patients. The health crisis is also proving to be very costly for less developed regions. With the WHO projecting Ebola infections to escalate to 20,000, the World Bank estimated that the epidemic can financially cripple the West African region with $32.6 billion in losses by the end of 2015. 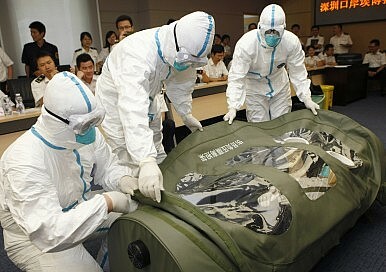 SARS set back the East Asian region by $20 billion in economic losses. East Asia has always been susceptible to infectious diseases. But with ASEAN playing a central role, the region can hopefully put up a strong defense drawing upon existing regional frameworks and the lessons learned from SARS and bouts of avian flu pandemics. With its experience with SARS and bird flu, the WHO noted that East Asia is more prepared than other region to respond to a possible pandemic with its existing mechanisms of surveillance and transparency. One such mechanism is the APT regional disease surveillance mechanism, which has a standardized Protocol for Communication and Information Sharing on Emerging Infectious Diseases that encourages member states to report all cases of diseases that are categorized as a PHEIC. Another mechanism is the Regional Multi-Sectoral Pandemic Preparedness Strategic Framework, which evolved from the ASEAN Highly Pathogenic Avian Influenza Taskforce (2004-2010). The framework combines collaborative pandemic preparedness with multi-level disaster management leveraging on the central role of the ASEAN Coordinating Centre for Humanitarian Assistance (AHA Centre). In addition, the expertise in joint disease surveillance and clinical management of the APT Field Epidemiology Training Network (FETN) can be utilized to conduct epidemiological studies and to share treatment protocols to comply with the ASEAN Minimum Standards on Joint Multi-sectoral Outbreak Investigation and Response. This framework has started discussions on the appropriate mechanisms to prevent and control Ebola. In terms of transparency, timely information sharing and capacity building, another mechanism is the ASEAN Risk Communication Resource Centre (RCRC), which aims to support efforts in managing health emergencies. Increased cooperation on emerging public health concerns is further underway. Last September, the 12th ASEAN Health Ministers’ Meeting issued a Joint Statement with China to increase health workers’ capacity to prevent newly-emerging infectious diseases including Ebola, H7N9, H5N1 and MERS-CoV. Despite WHO’s pronouncement, East Asian countries cannot let their guard down. With more uncertainty confronting global health security, increased vigilance, stepped up efforts in surveillance and transparency, as well as heightened public awareness should always be the order of the day for the region. Mely Caballero-Anthony is Associate Professor and Head of the Centre for Non-Traditional Security (NTS) Studies, S. Rajaratnam School of International Studies (RSIS). Gianna Gayle Herrera Amul is Senior Analyst with the RSIS Centre for NTS Studies. This article was first published as an S. Rajaratnam School of International Studies (RSIS) commentary. Taiwan and the Fight Against EbolaNorth Korea Bans All Tourism Over Ebola ConcernsADMM-Plus: Talk Shop or Key to Asia-Pacific Security?Pentagon Report Reveals Chinese Military DevelopmentsEast Asia's New Peacemaker: Mongolia?